Beginning around 1962, the flexi disc, or phonosheet, has been a low cost, low quality audio option for anything from Beatles Christmas “thank you’s” to fan club members, to a message from Biz Markie wedged inside issue #2 of Grand Royal Magazine that I need to dig out of the closet, to information on The New Ghostbusters Movie Mystery Sweepstakes found on specially marked cereal boxes back in 1989. 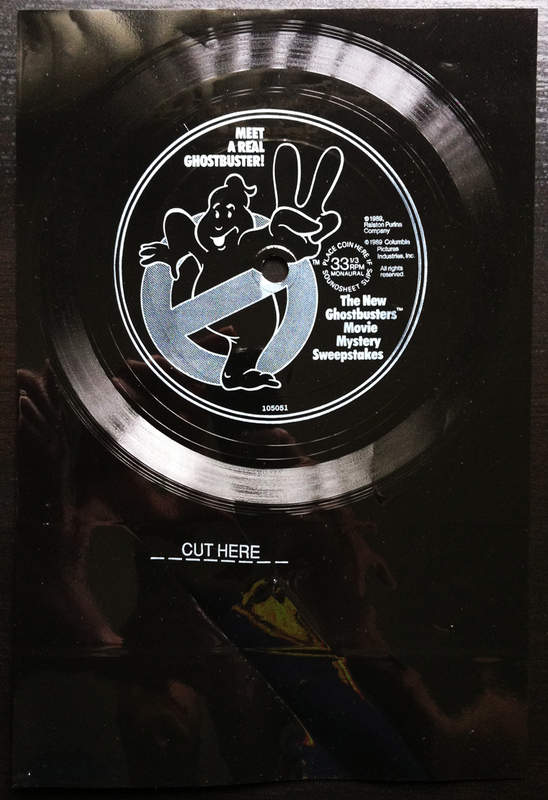 Only slightly thicker than a piece of paper, the flexi disc was a reasonable medium for offering audio, be it songs or clues on how to meet a REAL Ghostbuster, from unconventional sources. I imagine few of you to equate a box of breakfast with a vinyl record, but who knows. I’ve been surprised before. Once… he turns 9 this October. I joke. Question 1: Name the woman who works in the art museum, who is Peter Venkman’s girlfriend. Question 2: At what holiday does the big bust happen at the end of the movie? Question 3: What US monument do the Ghostbusters work from to save the city? Cheap ploy or not, I miss the days when I could stroll into a Piggly Wiggly and walk out with a record. For those of you dying to hear (what sounds like) the voice actor of Egon Spengler from The Real Ghostbusters cartoon show, a video of the record can be found here.